Since my election as president of the State Council and Council of Ministers, I have reiterated on many occasions our willingness to hold a respectful dialogue with the United States on the basis of sovereign equality, in order to deal reciprocally with a wide variety of topics without detriment to the national independence and self-determination of our people. 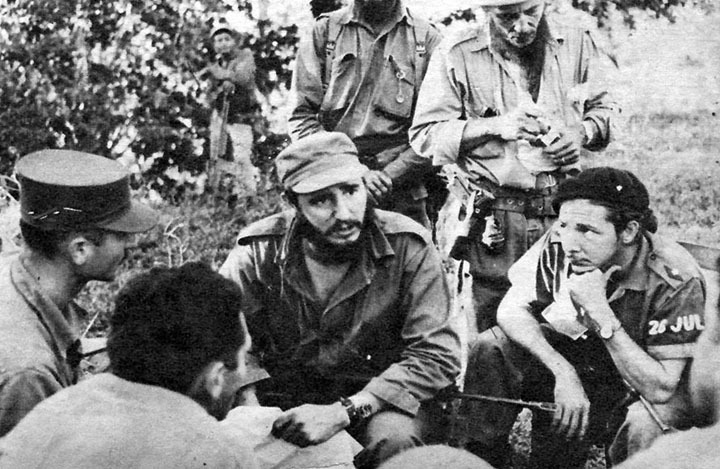 This stance was conveyed to the U.S. government both publicly and privately by Comrade Fidel on several occasions during our long standing struggle, stating the willingness to discuss and solve our differences without renouncing any of our principles. 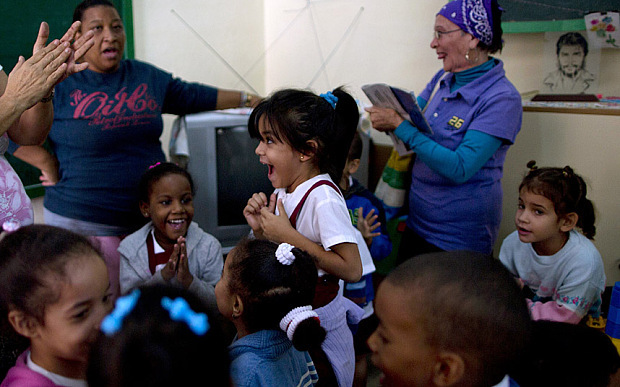 The heroic Cuban people, in the wake of serious dangers, aggressions, adversities and sacrifices, has proven to be faithful and will continue to be faithful to our ideals of independence and social justice. Strongly united throughout these 56 years of revolution, we have kept our unswerving loyalty to those who died in defense of our principles since the beginning of our independence wars in 1868. Today, despite the difficulties, we have embarked on the task of updating our economic model in order to build a prosperous and sustainable socialism. As a result of a dialogue at the highest level, which included a phone conversation I had yesterday with President Obama, we have been able to make headway in the solution of some topics of mutual interest for both nations. As Fidel promised in June 2001, when he said: “They shall return!” Gerardo (Hernandez), Ramon (Labanino ) and Antonio (Guerrero, the last three of the Cuban 5 still imprisoned in the U.S. after 16 years) have arrived today to our homeland. The enormous joy of their families and of all our people, who have relentlessly fought for this goal, is shared by hundreds of solidarity committees and groups, governments, parliaments, organizations, institutions and personalities, who for the last 16 years have made tireless efforts demanding their release. We convey our deepest gratitude and commitment to all of them. President Obama’s decision deserves the respect and acknowledgement of our people. I wish to thank and acknowledge the support of the Vatican, most particularly the support of Pope Francisco in the efforts for improving relations between Cuba and the United States. I also want to thank the government of Canada for facilitating the high-level dialogue between the two countries. I wish to thank and acknowledge the support of the Vatican, most particularly the support of Pope Francisco in the efforts for improving relations between Cuba and the United States. In turn, we have decided to release and send back to the United States a spy of Cuban origin who was working for that nation. On the other hand, and for humanitarian reasons, today we have also sent the American citizen Alan Gross back to his country. Unilaterally, as has always been our practice, and in strict compliance with the provisions of our legal system, the concerned prisoners have received legal benefits, including the release of those persons that the government of the United States had conveyed their interest in. We have also agreed to renew diplomatic relations. This in no way means that the heart of the matter has been solved. The economic, commercial and financial blockade, which causes enormous human and economic damages to our country, must cease. Though the blockade has been codified into law, the president of the United States has the executive authority to modify its implementation. We propose to the government of the United States the adoption of mutual steps to improve the bilateral atmosphere and advance towards normalization of relations between our two countries, based on the principles of international law and the United Nations Charter. Cuba reiterates its willingness to cooperate in multilateral bodies, such as the United Nations. While acknowledging our profound differences, particularly on issues related to national sovereignty, democracy, human rights and foreign policy, I reaffirm our willingness to dialogue on all these issues. I call upon the government of the United States to remove the obstacles hindering or restricting ties between peoples, families and citizens of both countries, particularly restrictions on travelling, direct postal services and telecommunications. The progress made in our exchanges proves that it is possible to find solutions to many problems. As we have reiterated, we must learn the art of coexisting with our differences in a civilized manner. We will continue talking about these important issues at a later date. 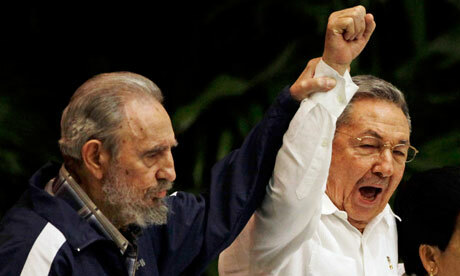 Young warriors Fidel and Raúl Castro fought the 1957-1958 revolution together. We are very happy that friendship has been restored between Cuba with its beautifull and courageous people and the United Nations. We will drink tonight a cuba libre on the health of both nations.